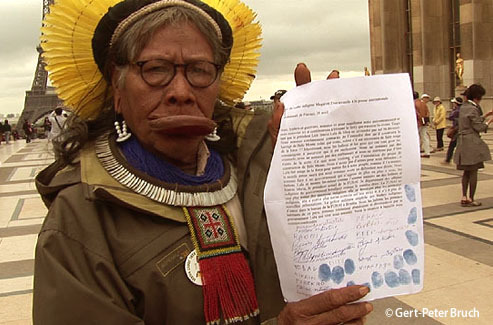 We, the indigenous people of Xingu, do not want Belo Monte. We, the indigenous people of Xingu, are fighting for our people, our land but also for the future of the planet. President Lula said he was worried about the Indians, he was concerned about the Amazon and that he did not want international NGOs to oppose the Belo Monte dam project. We are not international NGOs. 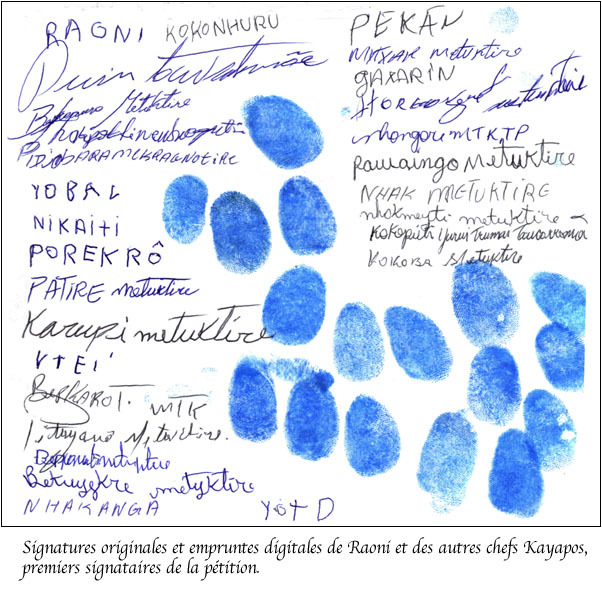 We, the 62 indigenous leaders of the villages of Bacajâ, Mrotidjam, Kararaô, Terra-Wanga, Boa Vista Km 17, Tukamâ, Kapoto, Moikarako, Aykre, Kiketrum, Potikro, Tukai, Mentutire, Omekrankum, and Cakamkubem Pokaimone, have already undergone many invasions and faced many dangers. When the Portuguese arrived in Brazil, we Indians, were already there; many have died, many have lost their vast territories, most of their rights, many have lost part of their culture and others have totally disappeared. The forest is our grocery store, the river our market. We do not want the Xingu rivers to be invaded and that our villages and our children, who will be raised according to our customs, be in danger. We do not want the Belo Monte hydroelectric dam because we know it will only cause destruction. We are not only thinking about the local implications, but about all the destructive consequences of the dam: it will attract even more businesses, more farms, it will promote the invasion of our lands, conflicts and even the construction of other dams. If the white man continues, everything will be destroyed very quickly. We ask: "What more does the government want? What good will so much energy do after so much destruction?" We have already held numerous meetings and have participated in major events to oppose the Belo Monte complex, as we did in 1989 and 2008 in Altamira, and in 2009 in the village of Piaraçu where many of our leaders were present. We have personally talked with President Lula to convince him that we did not want the dam and he promised us that it would not be forced upon us. We have also personally talked with Eletronorte and Eletrobras, as well as with FUNAI and IBAMA. We have already warned the government that if the dam project went through, the war would be declared and he would be made accountable. The government has not understood our message and, again, has taunted the indigenous peoples, ensuring that it will build the dam at all costs. When President Lula said this, he showed that he paid no heed to the voice of indigenous peoples and that he did not recognize our rights. His lack of respect led him to plan the tender for the Belo Monte during the Week of indigenous peoples. Because of this, we, the Indians of the Xingu region, have invited James Cameron and his team, representatives of the Xingu Forever Movement (as well as the women's movement, ISA and CIMI, AmazonWatch and other organizations). We want them to help us communicate our message to the world and to the Brazilians themselves who do not yet know what is happening in Xingu. We invited them because we know there are many people in Brazil and elsewhere who want to help us protect our rights and territories. They are welcomed among us. We fight for our people, our lands, our forests, our rivers, for our children and the glory of our ancestors. We are also fighting for the future of the planet because we know that these forests are not only beneficial to the indigenous people but to the Brazilian society and the world as well. We also know that without these forests, many people will suffer, much more than from all the destruction that occurred in the past. All life is interconnected, like the blood that unites families. The world must know what is happening here. People must realize that the destruction of forests and indigenous peoples will translate into their own destruction. It is for these reasons that we oppose Belo Monte. The dam will cause the destruction of our people. In conclusion, we proclaim that we are determined, that we are strong, that we are ready to fight and that we remember the words of a letter that a North American Indian had once sent to his President: “It is only when the white man has destroyed the whole forest, when it has killed all fish and all animals and that all rivers have dried up that he will realize that nobody can eat money. "